Rinse the quinoa and boil it (1 part quinoa/ 2 parts water/a pinch of salt). For salads, i like to rinse the quinoa again after boiling it. Roast the almonds in the oven or in a saucepan, in medium-low heat, until they get crunchy. Peel and slice the beetroots, chop the leeks, rinse the sugar peas and the physalis. Drizzle the olive oil in a saucepan and sauté the veggies for two minutes, we want to keep them crispy. Remove from the heat and keep aside. Start preparing the dressing by squeezing the orange, to get fresh juice out of it. Combine it with the rest of the ingredients and combine with a fork until smooth. Chop the dry apricots in small pieces. 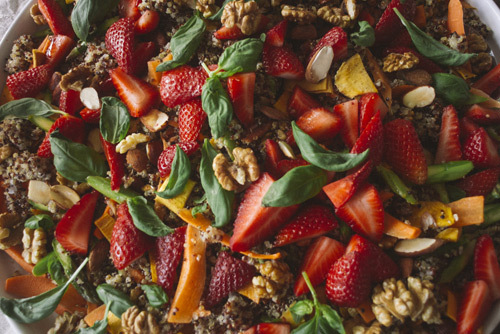 Place the quinoa in a big bowl, add the veggies, roasted nuts, physalis and apricots. Add some salt and pepper, adjusting seasoning. Serve with the dressing on the side. 2 tsp sea or Himalaya salt. Prepare all the vegetables by peeling and chopping the sweet potato and celery roots. Cut the leek and celery sticks in small bites. In a large saucepan heat the sesame oil. Add the spices, mustard seeds and ginger and stir. Add the vegetables with the salt and combine with the mix of oil and spices. Cook for a couple of minutes stirring constantly. Now add the water and the lentils. Cover the saucepan and cook for approx. 12-15 minutes in medium heat. You can add more water is needed (we want to keep little bit of liquid at the end of the cooking). Serve with some fresh coriander leaves. Combine the chickpeas, tahini, olive oil, water, salt and spices in a bowl and mix with a food processor until you get a soft but chunky consistency. Keep it aside. Prepare the assembling ingredients: Remove the cone of the cabbage with a knife and put it under water (running from the tap) for a few seconds, then separate the leaves one by one. Grind the carrots. Rinse the greens. To prepare the nuts, place the hazelnuts in a pan and toast them in medium-low heat until they are browned. Add the honey and salt. Combine with the nuts by using a wooden spoon. Remove from the heat and let them cool. To make the wraps, add some hummus inside of a cabbage leaf and on the top of the hummus some carrots, greens and toasted nuts, (if you wish, sprinkle some extra olive olive oil). Preheat the oven to 250°C. Cut the sweet potatoes in two halves and place on a baking tray. Roast in the oven for 40-50 minutes to 200 °C, until soften. Remove from the oven, let them cool, and then peel. Place them in a bowl and mash until smooth. Chop thin the fresh parsley, coriander leaves and garlic by using a knife or a food processor, grind the hazelnuts. Mix with the sweet potato puree adding also the buckwheat flour, cumin, baking powder, lemon juice, olive oil and salt. Stir with a spoon. Start to make small falafel balls by using your hands and place them on a baking tray covered with parchment paper. Bake for 15-20 minutes in 200°C, turn them a couple of times while they're in the oven. Enjoy your falafel with some fresh salad, tomatoes, beetroots, and some of your favorite dip, i love to make one based on plant yogurt, tahini, lemon, olive oil and salt. Cut the pumpkin in two halves and place them with the leek directly on a baking tray. Roast at 200°C for 30-40 minutes. Remove from the oven and let them cool. Spoon out the flesh and place in a blender or by using a food processor, together with the roasted leek, coconut milk, parsley, coriander and ginger, mix in high speed until smooth. Transfer to a pot to warm up, add some salt and pepper. Before serve it, decorate with some herbs or/and seeds and squeeze some fresh lime to “pop up” the taste. Salad: Preheat the oven to 250°C. Slice the pumpkin and place the pieces directly on an oven tray (without any oil), bake for 30-40 minutes in 200 °C. Rinse and chop the kale leaves, put it in a bowl or big dish and add the oil and salt. Massage the kale with your hands until it starts to soften. In a saucepan, roast the pecan nuts (do it in low heat to avoid burning them). Cut the figs in halves and place on the bowl. Let the pumpkin cool and combine with the rest of the ingredients. Dressing: Combine the tahini, oil, water, lime juice and coriander leaves by using a food processor until you get a creamy consistence. Spread some black pepper on the top and serve the dressing on the side. In a saucepan, add the millet flakes, nutmeg, a pinch of sea salt, water and milk. Cook as a porridge on medium/ low temperature for about 10 minutes, stir often with a spoon until all the liquid is completely gone. Preheat the oven 250 °C. Chop the chanterelles and leek into small pieces. Wok them with some sesame oil, sea salt & black pepper. Cover small oven forms, or use a big one with some sesame oil. Add the woked vegetables first and then the millet on top. Bake at 200°C for about 20/25 minutes until the top starts to get crusty. If you like cheese, you can also spread some of your favorite one over your tarts 5 minutes before you take them out of the oven. Serve with ground hazelnuts and fresh parsley, drizzle some sesame oil on top as a last touch. Chop the green beans and tomatoes. Slice the avocados and cut of the corn kernels. Cut the leek into small pieces. Place these ingredients in a big bowl. Add the mung beans sprouts and spread some fresh dill on the top. Combine. Dressing: whisk all the ingredients. Taste and add more salt & pepper if necessary. Serve on a side. Sometimes i enjoy this salad by adding some natural plant yogurt to the main recipe. Quinoa salad: Rinse the quinoa before cooking it. Put the rinsed quinoa in a saucepan, add water and salt. ( 2 cups of water for one cup of rinsed quinoa, or 3 cups for 1 cup of dry quinoa). Cover and bring to boil. Simmer for 15-20 minutes, (the water must evaporate). Let it cool. Cut the asparagus, strawberries and carrots in thin slices. Roast the nuts in a saucepan in low heat, stir quite often. Chop the dried mango into small pieces. Once you have all the ingredients ready, combine them in a bowl. Dressing: mix the juice from a fresh orange, honey, olive oil, salt & pepper by hand. Combine the dressing with the salad using a big spoon. Add some extra olive oil and black pepper to taste. Decorate the salad with some fresh basil leaves. Slice the beets thinly, using a sharp knife or mandolin. Place them on a plate. Add the spinach and raisins. Put the pumpkin seeds in a food processor and mix them until they turn into a powder. Spread it over the salad. Add the olive oil, salt and pepper. If you like black olives, you can use them instead of raisins. Beet rice: Boil the beets until they get soft. Remove and peel them. Chop the onion into small pieces . Heat some olive oil in a saucepan, add the onion and fry. Mix the beets and onions with a food processor. Add some salt & pepper. Cook the rice. I normally use 3-4 times water for one cup of whole grain rice, and two pinch of sea salt. When the rice is ready (and all the water is completely gone), mix the beet cream and the rice. Add a spoon of olive oil, and maybe a little bit more salt & pepper to taste. 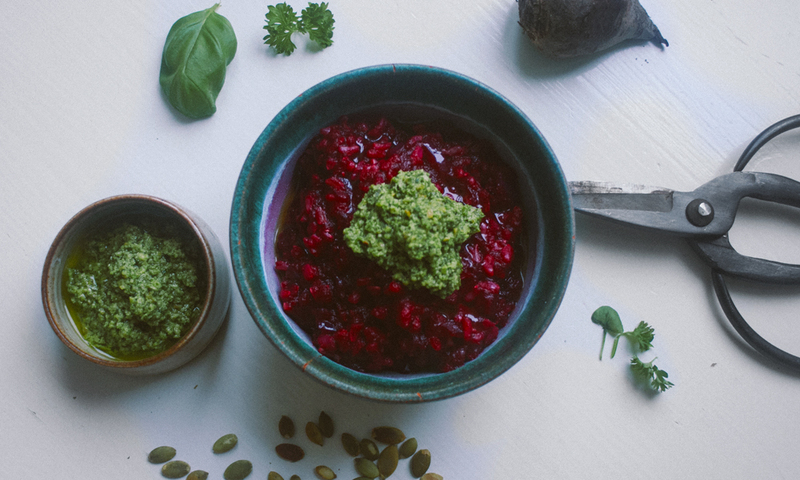 Parsley pesto; Chop the fresh parsley and basil leaves. Blend the pumpkin seeds with a food processor. Mix the herbs, seeds, olive oil, salt & lemon juice by hand in a bowl. I love to serve this meal with some ripe cherry tomatoes on the top. Raw couscous: Rinse and grate the cauliflower into small pieces that look like couscous. Chop the mint and parsley leaves. Combine all the ingredients in a bowl. Add the raisins, goji berries, salt, pepper and olive oil. Tahini dressing: Mix all the ingredients by hand until they are completely incorporated and the texture is not too thick. 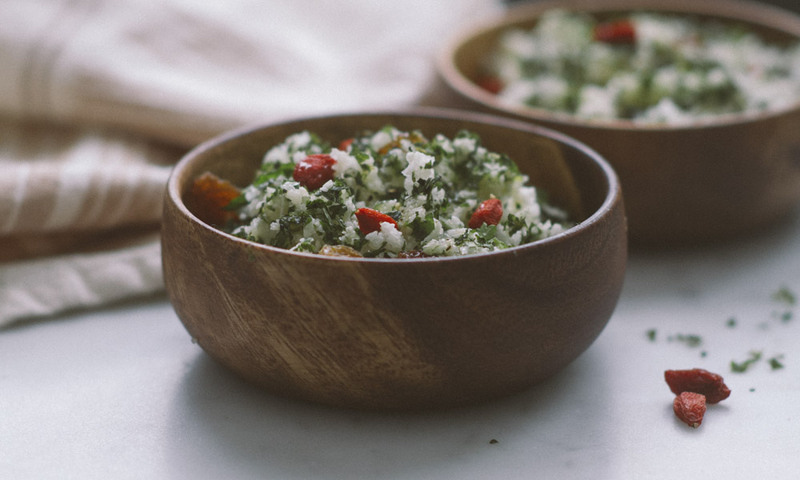 You can serve the couscous with a fresh tabouleh salad: tomato, cucumber, fresh mint and parsley leaves and some chopped red onion. Carrot salad: Grate the carrots. 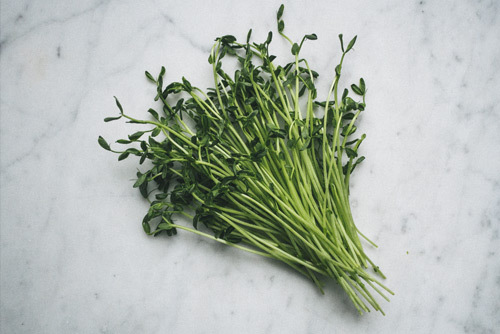 Chop the fennel into small pieces and cut some fresh parsley leaves. Place all the vegetables in a big container. Add the pomegranate and sunflower seeds. Blood orange dressing: In a glass, mix the juice from a blood orange with honey, olive oil salt & pepper. 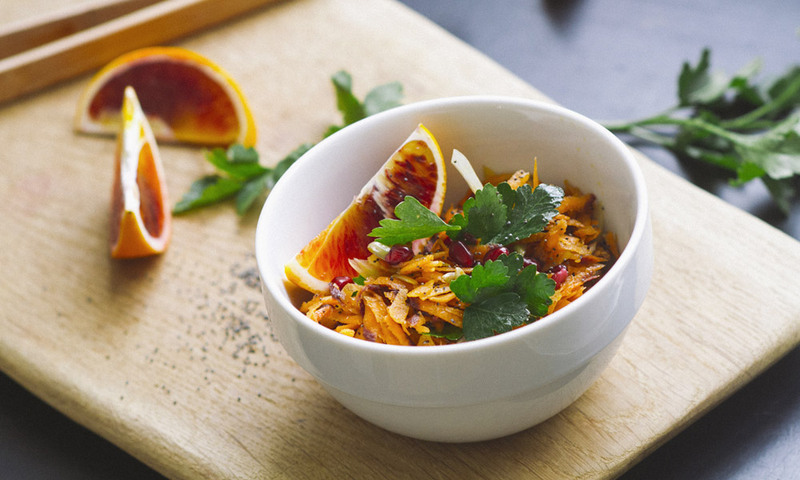 I serve this salad in small bowls with some spoonfuls of dressing, extra poppy seeds and slices of blood orange.